Faith and hope and charity. In Harry Potter and the Half-Blood Prince (2005), a young Tom Riddle asks Horace Slughorn, “Can you only split your soul once? Wouldn’t it be better, make you stronger, to have your soul in more pieces? I mean, for instance, isn’t seven the most powerfully magical number, wouldn’t seven?” (Rowling, p. 466). Rowling herself answers this last question repeatedly throughout the series—a resounding “No”. Seven is not the most powerfully magical number. In the Potter verse, as in many other places in literature and mythology, the most powerfully magical number is three. In many major and minor ways, Rowling continually returns to the number three as symbolic of what might be called “perfect balance”. 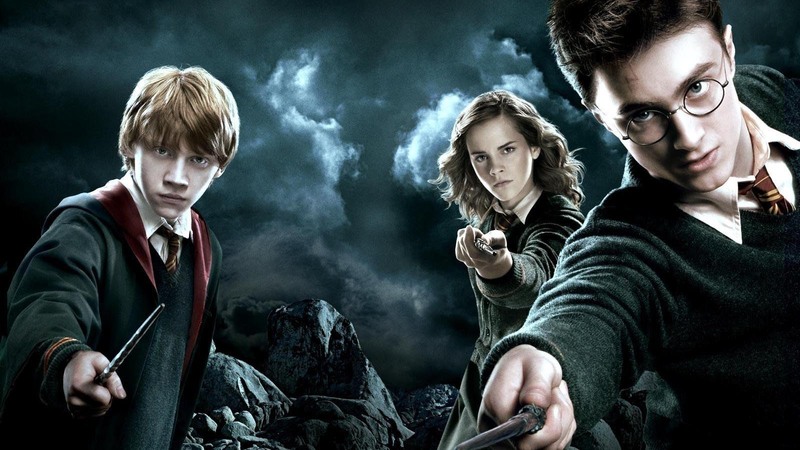 And, at the very core, a trinity of triads are central to the story itself: the three Unforgivable Curses (Crucio, Imperio and Avada Kedavra), the three Deathly Hallows (the Resurrection Stone, the Elder Wand, and the Invisibility Cloak), and the most important of all, the Trio (Harry, Hermione, and Ron). In fact, the author intends to argue, quite strenuously, that Harry Potter is not even the main protagonist of the series; the protagonist is a classic trinity structure: Hero, Anti-Hero, and Heroine, with Harry, Ron, and Hermione Christopher Bell, Ph.D., assistant professor attendant in the Department of Communication, University of Colorado Colorado Springs; Director of Center for Excellence in Communication. each of these triads, both internally among its constituent elements and externally to the other two triads, comprises the central conflict of the series. Three is, in fact, the magic number for Harry Potter. produced six children: three males and three females. Hera, Demeter, and Hestia were the daughters and Poseidon, Hades, and Zeus were the sons. When these children of the Titans ascended to Mount Olympus to rule as gods, the demiurgic triad of Zeus, Hades, and Poseidon ruled over them. Zeus, the god of the heavens, ruled the sky; Poseidon, the god of the sea, ruled the mortal plane; Hades, the god of the underworld, ruled below. This particular triad will be repeated later in Christian mythos, in Heaven, Earth, and Hell. maiden, the woman, and the crone. Similarly, The Musai (or The Muses) were made up of nine (i.e., three times three) goddesses: Euterpe (music), Polyhymnia (the sacred), Calliope (poetry), Terpsichore (dancing), Clio (history), Erato (lyric), Thalia (comedy), Melpomene (tragedy), and Urania (astronomy)—each lending their inspiration to a form of art significant to the Greeks (interestingly, originally, there were only three Muses: Aoide—song, Melete—practice, and Mneme—memory). the three keys to a good life. understanding a triadic structure of a single entity. The hero, therefore, is a denizen of the natural world, a flawed being in a flawed universe. The hero sacrifices, figuratively and literally, over the course of an adventure: a series of risks, obstacles, dangers, and temptations. Physically taxed, emotionally challenged, perhaps even materially drained, the hero overcomes, confronts a great peril (externally, as in a villain, or internally, as in a personal demon or fatal character flaw), and returns home in triumph, a changed person. Vogler (1992) identified the role of the hero as: … to give the audience a window into the story. Each person hearing a tale or watching a play or movie is invited, in the early stages of the story, to identify with the Hero, to merge with him and see the world of the story through his eyes. Storytellers do this by giving their Heroes a combination of qualities, a mix of universal and unique characteristics. (p. 40) The hero, therefore, is the reader’s conduit to the living world of the narrative. The hero is the point of identification and the locus of understanding within the storytelling structure. Walsh (2010) further advanced the notion of the hero by introducing the “trinity protagonist structure”. Elizabeth Swann (the feisty and noble Heroine). Many other examples abound: Terminator 2’s (1991) John Connor, Sarah Connor, and the Terminator, for instance, Neo, Morpheus, and Trinity in The Matrix (1999, 2003, 2003) series; Alan Grant, Ellie Sattler, and Ian Malcolm in Jurassic Park (1993). The trinity protagonist structure can be easily confused with other narrative structures. For example, in some stories, the Hero has the main plotline. In Star Wars, Han Solo changes from a selfish scoundrel to noble hero. Elizabeth Swann in Pirates of the Caribbean begins her story as a rather typical damsel in distress, but ends as a leader and warrior. When this happens, the story escapes being just about a hero and his helpers, but a true Trinity of protagonists, with each their own equal share in the story. 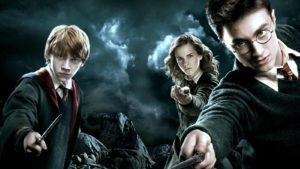 One of the most salient examples of the trinity protagonist structure in modern literature is that of Harry Potter, Hermione Granger, and Ron Weasley. While many tend to focus on Harry Potter as the main character of the story, simply because his name happens to appear in the title, it is clear to this author that, in fact, the real protagonist of the Potter series is not Harry Potter, but a triadic and aspect-based single entity made up of three distinct yet wholly symbiotic parts: Hero, Anti-Hero, and Heroine. Removing any one of the three elements and the whole falls apart. Broomsticks”) to the mythological (Fluffy, the three-headed dog guards the entrance to the hiding spot of the sorcerer’s/philosopher’s stone) to the meaningful (the love triangle among Lily Evans, James Potter, and Severus Snape lies at the very heart of the story), Rowling uses triads to underpin the series, building on the strong foundation the triangular structure provides. Consider the Tri-Wizard Tournament, around which all of Harry Potter and the Goblet of Fire (2000; hereafter GoF) is written: Three wizards from three different wizarding schools compete in three tasks to win a fabulous prize—and when that harmonic structure is disrupted, by adding Harry to the mix, it falls apart rather quickly. When The Trio plans to invade the Department of Mysteries in Harry Potter and Order of the Phoenix (2003; hereafter OotP), only three members of Dumbledore’s Army show up to help—Ginny Weasley, Neville Longbottom and Luna Lovegood—preserving the power of the triangular foundation. Harry’s most basic and necessary support frameworks are made up of threes: First his family (Lily, James, and Harry), then the Dursleys (Vernon, Petunia, and Dudley), and then the Weasleys that, for all intents and purposes, adopt him (Arthur, Molly, Charlie, Bill, Percy, Fred, George, Ron, and Ginny—nine in all). Everywhere one looks in the Potter verse, powerful threes abound. Rowling’s masterful use of the triadic structure is evidenced at the very heart of the series. The entire narrative hinges upon not simply one triadic structure, but three triads positioned to form one umbrella trinity—a “supertrinity”, if you will. It is the interplay among these three triads that forms the basis for the entire Potter series. In each triad, we find similar elements (and elements similar to the Christian deitic trinity): power, love, and knowledge. So, too, the supertrinity is balanced along the same lines (see Figure 1). Figure 1. Interplay of triadic elements. equally strong bond of friendship and trust” (Rowling, 2003, p. 223). sheer luck and more talented friends. He is mediocre to the last degree” (Rowling, 2005, p. 31). Repeatedly, Harry makes poor decisions, blunders off into situations he should not be without the benefit of forethought and allows his emotions to get the best of him. This tendency culminates in the death of his godfather, Sirius Black, when Voldemort uses Harry’s own foolhardiness to trick him into a trap (Rowling, 2003). Hallows (2007; hereafter DH), she literally saves Ron’s life while Harry Potter fumbles around uselessly (Rowling, 2007, p. 269). Knowledge without love will make us cold and arrogant. Without love’s ability to bring people together for mutual benefit, knowledge can become selfish and aloof… Power without love, on the other hand, will make us cruel and uncompromising. Power needs love to soften it and make it malleable. Ron’s unshakable loyalty and willingness to sacrifice himself for his friends has been evident from the beginning of the series: Ron sacrifices his own safety, so that Harry and Hermione can advance to find the Sorcerer’s Stone (Rowling, 1997, p. 283); Ron accompanies Harry into the Forbidden Forest to find Aragog despite spiders being his greatest fear (Rowling, 1999, p. 272); it is Ron who saves Harry’s life and destroys the Locket of Slytherin even as it taunts him that no one will ever love him (Rowling, 2007, p. 371). Although clearly both Harry and Hermione can love, and Ron and Harry are at times extremely clever, and Hermione and Ron both have day-saving moments of direct agency, none of the three possess equal measures love, knowledge, and power. Each contains vastly more of one than of the other two, and in doing so, becomes an integrally balancing part of the trinity protagonist structure. extension, Voldemort himself. Consider that no one within the Trio, not even Harry Potter, is allowed to utilize any of the Unforgivable Curses. It is not simply that they are unable to—they have literally no access to the Curses. The one time Harry tries, he is reprimanded by Bellatrix Lestrange, Voldemort’s chief lieutenant: “Never used an Unforgivable Curse before, have you, boy?” she yelled… “You need to mean them, Potter! You need to really want to cause pain—to enjoy it—righteous anger won’t hurt me for long…” (Rowling, 2003, p. 810). torture someone if you can perform the Cruciatus Curse” (Rowling, 2000, p. 215). Torture is an act of total power; it is the ability to enact violence without repercussion or fear of reprisal on a fellow human being. Torture is a “form of savagery and stupidity. The real aim of torture is the display of power, albeit a fictional one, through the medium of broken bodies and minds” (Iacopino, Keller, & Oksenberg, 2002). The Cruciatus Curse serves as the wizarding world’s version of waterboarding; it is a display of power (and a display of the ability to remove one’s power) reserved for use only for the most vile and warped of criminals. Finally, the definitive Unforgivable Curse is the one that utterly destroys love and the ability to love: Avada Kedavra. Avada Kedavra is the Killing Curse, and it is “Not nice. Not pleasant. And there’s no countercurse. There’s no blocking it” (Rowling, 2000, p. 216). It is the decisive weapon in Voldemort’s arsenal. He and his minions are willing to kill. The Trio and their allies are not. In Harry Potter and the Deathly Hallows, Hermione relates the fairy tale of The Three Brothers. In this tale, Death comes for three brothers, but is thwarted. Embarrassed but cunning, Death pretends to congratulate the three brothers, and offers each a gift of his own choosing (Rowling, 2007, p. 407). The first Hallow—the Elder Wand—inhabits the power locus of the knowledge element of the supertrinity. … The oldest brother, who was a combative man, asked for a wand more powerful than any in existence: a wand that must always wind duels for its owner, a wand worthy of a wizard who had conquered Death! So Death crossed to an elder tree on the banks of the river, fashioned a wand from a branch that hung there, and gave it to the oldest brother. (Rowling, 2007, p. 407) The Elder Wand is an artifact of pure power, designed to defeat any wand standing against it. The Resurrection Stone’s great gift is the ability to restore love lost to death, just as Avada Kedavra’s malevolent power is to destroy the ability of love through inflicting death. The youngest brother receives his gift out of wisdom and knowledge that one can never truly cheat death, and that eventually death comes to us all. Therefore, his gift outsmarts death temporarily, and in the end, the youngest brother is the only one that meets Death on its own terms. can be used to return the person to life. Harry Potter can ride a broomstick better than anyone and fight Voldemort’s basilisk hand-to-hand, but requires Hermione to know a simple spell to unlock a door (Rowling, 1997, p. 160). Voldemort’s disdain for love and his lack of ability to see its necessity is his ultimate downfall. Because Voldemort cannot love and does not possess the knowledge/wisdom to guard himself against someone he sees as so far beneath himself, his power is eventually stripped. A triangle tipped onto its point cannot stand; the balance is essential for stability. In placing all of his faith in one locus of the supertrinity, Voldemort invites his own destruction. Conversely, the ability of the Trio to complement each other, to correctly utilize the Hallows to defeat the Unforgivable Curses (and, by extension, to defeat Voldemort himself) recognizes and harnesses the full power of the balance of the supertrinity structure. masterfully done in the Potter series can only further add to the stability of the internal structure of the tale. We gravitate toward this perfect harmony, once again reaffirming the trinity structure as our most primal, fundamental understanding of organizing the universe. Bonnefoy, Y. (1992). Roman and European mythologies. Chicago, I.L. : University of Chicago Press. Bordwell, D., & Thompson, K. (1979). Film art: An introduction. Reading, M.A. : Addison-Wesley Pub. Campbell, J. (1949). The hero with a thousand faces. New York, N.Y.: Pantheon Books. McMaster, J. (1992). The trinity archetype in the Jungle Books and the Wizard of Oz. Children’s Literature, 20, 90-110. Rowling, J. K. (1997). Harry Potter and the sorcerer’s stone. New York, N.Y.: Scholastic Press. Rowling, J. K. (1999). Harry Potter and the chamber of secrets. New York, N.Y.: Arthur A. Levine Books. Rowling, J. K. (2000). Harry Potter and the goblet of fire. New York, N.Y.: A.A. Levine Books/Scholastic Press. Rowling, J. K. (2003). Harry Potter and the order of the phoenix. New York, N.Y.: Arthur A. Levine Books. Rowling, J. K. (2005). Harry Potter and the half-blood prince. New York, N.Y.: Arthur A. Levine Books. Rowling, J. K. (2007). Harry Potter and the deathly hallows. New York, N.Y.: Arthur A. Levine Books.